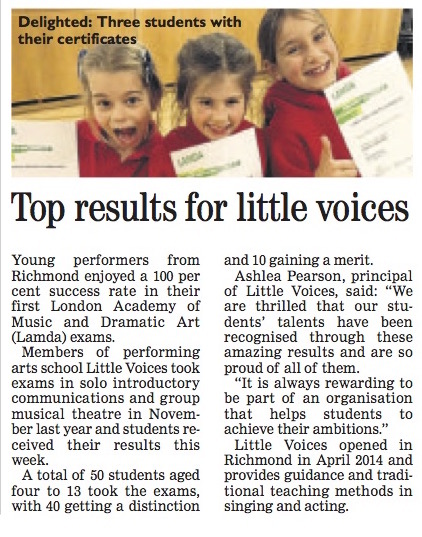 Top Results For Little Voices SWL! Little Voices SWL performing arts schools have helped students in and across Richmond Upon Thames, Putney and Fulham to achieve outstanding results in there London Academy of Music and Dramatic Art (LAMDA) examinations. In November children took exams in grades in Solo Introductory Communications and Group Musical Theatre Examinations with 40 achieving a distinction and 10 a merit, and yet again, Little Voices has maintained its outstanding 100% pass record. The students ranged from aged 4 to 13 years.